There is something about celebrating events and festivals outdoors that simply leaves us all mesmerized. No matter how awesome your Thanksgiving party already is, it becomes even more special when you take it outside and make nature a part of it all. It is a dream for many of us that keeps slipping away, mostly because of logistics or weather. 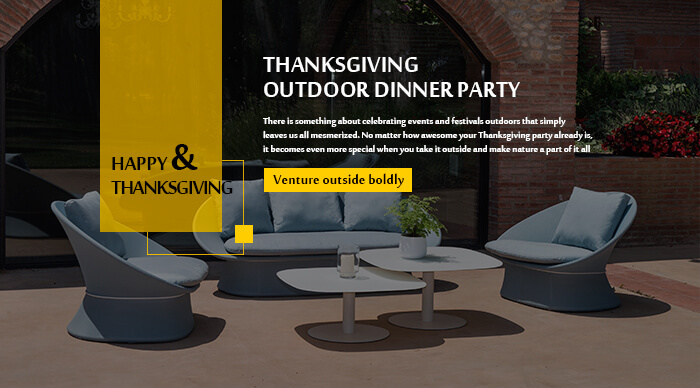 But this year, you might finally want to take the bold step of venturing outdoors and hosting an alfresco Thanksgiving dinner party. While there are plenty of gorgeous and outstanding Thanksgiving table settings for you to swoon over here, the important thing to remember is that your outdoor Thanksgiving dinner experience is not about capturing the perfect picture. Do not be too obsessed with aesthetics that are often plastered all over catalogs throughout the holiday season (and make your table seem like a poorly crafted kids’ project in comparison)! Think of things like proximity to the kitchen, shelter from a possible cold breeze in the evening, space for your guests and other such ergonomic factors before you spend endless hours on the ‘right look’.